Tetris (テトリス) is a 1988 arcade game developed and published by Sega for Sega System 16 arcade hardware. It is a derivative of an earlier Tetris game, created by Alexey Pajitnov for Soviet Elektronika 60 terminal computers in 1984. Though Tetris is a Russian invention, the Mega Drive version was officially released only in Japan. While the first version of Tetris (built for Russian Electronika 60 terminals) can be dated back to 1984, the first commercial versions of the game released in the West debuted in 1987, when Mirrorsoft (under license from Andromeda) began releasing the game for various home computer platforms. Sega's versions debuted in 1988, meaning they were amongst the earliest interpretations of the game. As a result, the System 16 version of Tetris plays very similarly to 1984 Electronika 60 and 1986 IBM PC versions of the game, albeit with enhanced graphics and audio (which in this case, also means the addition of music). While licensed from Atari Games (who were not interested in publishing their own Tetris arcade game in Japan), the Sega versions share little in common with the Atari Games arcade version (also from 1988), with the two games having likely been developed independently with no knowledge of each others' progress. The Sega versions of Tetris are played against backgrounds seemingly sourced from around the world, in contrast to the earlier home computer versions which seeked to capitalise on Russian imagery (to the point where they are technically known as "TETЯIS" rather than "Tetris". If four lines are cleared in one move (a "tetris"), this background changes. Also featured is a preview of the next tetromino, which is a feature carried from the Western computer versions. The Sega versions of Tetris are more "rigid" than later games, only allowing for pieces to be rotated if there is room (i.e. a piece is not "pushed" left or right if there is space to do so, and the player is not given the chance to rotate a piece shortly before it stops). More leeway is given to the player than the original Russian versions of the game, but the Sega versions are far less forgiving than their Atari Games/Tengen counterparts in the West. Nevertheless, the ruleset, affectionately called Sega rotation became a fixture in Sega's other Tetris-inspired games during the late 1980s and 1990s, and became a de facto standard for Japanese Tetris games (until The Tetris Company established official standards in the early 2000s). The System 16 version of Tetris also includes a talking monkey which acts as a guide during the attract sequence. Monkeys would appear in later Sega-published Tetris titles as well. Also, while Tetris became would become synonymous with Russian folk songs (most notably, "Korobeiniki"), the Sega soundtrack is entirely original and to date has only appeared in Sega versions of Tetris. In addition, as the speed of the game increases, the the tempo of the main theme also gets faster. Complications regarding dealings with the then-communist regime of the former Soviet Union meant that during the mid-to-late 1980s, a number of companies from all over the world claimed to have the rights to Tetris. Tetris had been a puzzle game created by Alexey Pajitnov and subsequently sold to the Soviet government for a planned ten yearsin around 1986. The Soviets marketed Tetris to export markets via an organisation called "Elektronorgtechnica", typically shortened to Elorg, and from 1988 onwards began to take an interest in contracting licenses for the game for non-Soviet markets. Prior to this, numerous versions of Tetris had been "unofficially" licensed and sub-licensed by British software house Andromeda, who had in turn bought the rights to a version of the game found in Hungary. Mirrorsoft and Spectrum HoloByte had published versions of Tetris in 1987 and 1988 respectively (under license from Andromeda), and there had been many unofficial knock-offs and clones for a variety of systems prior to these dates. Elorg signed three deals, one allowing Atari Games to make arcade versions of Tetris, another allowing Bullet-Proof Software (BPS) to create home versions in Japan, and a final deal with Nintendo, which covered home console and handheld versions in the West. Most famously, a deal between BPS and Nintendo resulted in the iconic Game Boy version of Tetris being released in 1989. In other cases, the relationship was not as clear cut - Atari Games' attempt to port its arcade version of Tetris to the Nintendo Entertainment System (via its home console division, Tengen) resulted in a legal battle which Atari Games would lose. Since 1996 onwards the license has been held by the aptly named The Tetris Company, which has handed licenses to numerous publishers over the years. While Atari Games held the rights for arcade versions of Tetris, their business was based primarily in the United States. Sega of America re-resentitive Steve Hanawa "discovered" the game on behalf of the company and a deal was made for Sega to produce and market their own versions of Tetris for the Japanese arcade market. 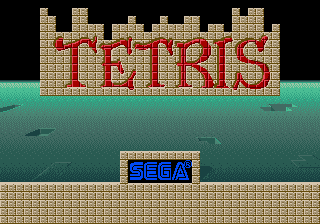 This led initially to a Sega System 16 version, also in 1988, with other variants of Tetris to follow. Sega's version of Tetris was a phenomenal success in Japan, prompting multiple extra versions of the game - one for Sega System E hardware, and perhaps most bizarrely, versions for Taito's B-System and H-System arcade boards in Japan. The B-System versions were released as upgrade kits for Taito's Nastar and Master of Weapon; the H-System version appears to have been sold on modified boards that previously held Taito's Go for the Gold (released overseas as Recordbreaker) rather than as an upgrade kit. Less successful was Sega's attempt and bringing this version to their own home system, the Sega Mega Drive. Much like Tengen's NES version, sales were blocked in Japan, likely this time by BPS, and it is thought that as little as only 10 cartridges were ever produced. It is one of the few Mega Drive games which Sega actively pretends did not exist, and what few copies survive are extremely rare collector's items, being sold in auctions for up to US$16,000 ((in)famously a signed copy was once put up US$1,000,000,000). Unlicensed copies of the game are far easier to find, however. The Mega Drive release is curious as while it credits Tengen and Elorg as it probably should, it also credits Mirrorsoft. Either way, as Sega had full authority over arcade versions, the Sega Mega Drive port was brought to Mega-Tech hardware in 1989 with no problems. There is the potential that a planned Mega Drive version of Flash Point may have suffered a similar fate. Sega's versions of Tetris are significant, as while they are typically eclipsed in the West by what Nintendo was doing with its Game Boy, the concept of Sega rotation influenced most Tetris games going forward. Furthermore Sega's choice of music and aesthetics were adapted for the Sega Saturn game Tetris-S and the 1999 release of Sega Tetris. The Sega Ages 2500 Series Vol. 28: Tetris Collection PlayStation 2 compilation includes a licensed version of this version of Tetris for the Mega Drive. NEC Retro has more information related to Tetris.